Inkdrop on Windows randomly not shutting down correctly again last 2 versions. App Version: previous and current version I believe. Quit Inkdrop and hope that it does not close properly, I can’t find a way to reproduce it every time. 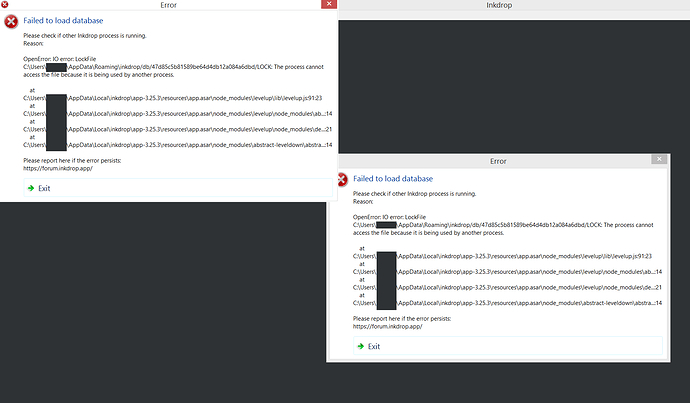 A very similar bug has occurred before though but then it did not show up at all nor with error dialogs. So maybe just check what you did to fix it last time and see if there are any changes? The major change of last 2 versions is to upgrade Electron from 1 to 3. I suspect that it may cause the problem but I’m not sure why at the moment. I will check restarting the app on Windows and see if any error occurs. That’s weird. Please tell me if you get any error in the console. # Check failed: (isolate->snapshot_blob()) == nullptr. And it seems that the app is broken and won’t launch again. I reinstalled the app then it launched. Above error looks like a Chromium-related issue, so I guess this is an Electron’s bug. But couldn’t find any bug report there. I will upgrade Electron version in the next release. I found Inkdrop sometimes unloads very slowly for some reason. But it basically just unloads the database and remembers the window size and position, and there are no additional tasks when unloading. I updated Electron version to 3.1.4 but nothing changed. I tried Electron@4 but found it has another problem such as printing. I hope it will be resolved in the future. For some reason when I opened it today it fixed itself … not sure why but I will take it for now. @Yuko_Otawara pointed out how to reproduce this issue and I found the solution for it. The issue happens when you quit the app after editing a note without waiting for auto-save. The app’s main process hangs and never stops. I made the app unload local database first when quitting, then the issue disappeared. v3.25.4 has been released. Thank you for reporting it!